The Korea-Japan Basic Treaty was signed on June 22, 1965, reestablishing normal diplomatic and economic relations 20 years after Korea was liberated from Japanese colonial rule in 1945. The treaty was followed by five additional agreements covering specific issues: fisheries, the status of Koreans residing in Japan, property claims and economic cooperation, cultural matters, and the mechanism for settlement of disputes. To be sure, tens of thousands of Koreans protested using slogans such as, ``Stop the Humiliating Diplomacy.'' In Japan too, opposition leaders held large anti-treaty protests. In retrospect, however, the treaty was a big breakthrough enabling Korea to move forward to a more pro-active nation building program, encompassing successful economic development. Korea became a major player in the Cold War alliance system in the next decades after settling many problems which had existed between South Korea and Japan since 1945. Since the first talks in March 1952, organized by the Supreme Commander for the Allied Powers (SCAP) headquarters in Tokyo in the middle of the Korean War, the two governments went through seven fluctuating normalization sessions until the final treaty signing in June 1965. South Korean President Syngman Rhee (1948-60) loathed Japan with a passion. His attitude toward Japan was very emotional and nationalistic. He refused to engage in meaningful dialogue. The Japanese government in the 1950s was also not inclined to assuage Korean sensibilities, which was well demonstrated in 1953, when the chief Japanese delegate in negotiations, Kubota Kanichiro, told his Korean counterpart that Japan's 35-year occupation of Korea was beneficial to the Korean people. Such words caused a firestorm in Korea, and the talks were stalemated for the next five years in an atmosphere of mutual distrust. Significant progress in Korea-Japan relations began when John F. Kennedy was inaugurated as the U.S. president, and Korean Army Maj. Gen. Park Chung-hee took power in the May 1961 military coup. Washington worked hard for normalization, pushing Japan toward a regional economic effort in Northeast Asia. Within three months of Park's 1961 coup, and after some initial misgivings, U.S. Ambassador to Korea Samuel Berger strongly endorsed the junta, reporting to Secretary of State Dean Rusk that it was a ``genuine revolution from the top.'' American economic aid quickly increased by nearly 50 percent from $192 million in 1961 to $245 million in 1962. The main breakthrough for the normalization process occurred in the sixth round of talks from October 1961 to April 1964 with increasing U.S. pressure on both sides. In October 1961, Kim Jong-pil, Park's right-hand man and the Korean CIA director, went to Tokyo for consultations. A month later Park Chung-hee accepted an invitation from Japanese Prime Minister Ikeda, a visit the U.S. Secretary of State Dean Rusk brokered. The first breakthrough was made on the issue of Korean and Japanese claims against each other in an exchange of ``Memorandum'' between Kim and Japanese Foreign Minister Ohira Masayoshi in November 1962. In this document, they reached an agreement on the amount, but not the formal terms to describe, compensation for Korean claims: $3 million grant, $2 million in government loans, and $1 million, later increased to $3 million, in private commercial loans. The bilateral economic relationship jump-started immediately. The final breakthrough came in 1964 under strong pressure from America which was increasingly engaging in the Vietnam War. Kim again went to Tokyo to clear up the terms to be applied to the claims settlement. Koreans wanted ``reparations.'' Japan insisted the bundle of grants and loans not be called ``reparations.'' The talks temporarily stopped due to violent domestic demonstrations by Korean students who sensed the talks were in their final phase. Park recalled Kim and suppressed the fierce anti-Treaty protests with martial law in June 1964. Although Park still remains a controversial figure in modern Korean history, his realistic political sense and leadership, his long-term vision and commitment to Korea's economic development, backed up by bold and tough bargaining skill with Japan and the United States, were crucial in this final phase. The U.S. wanted help in Vietnam, and Park offered several times to send Korean troops to Vietnam. He dispatched a Korean mobile army surgical hospital (MASH) unit in mid-1964. In February 1965, Korean and Japanese representatives initialed agreements on all the outstanding issues except the issue of the Dokdo Islets in the East Sea of Korea. At that time, President Park insisted on Korea's effective occupation of the islets, asking U.S. officials to mediate to keep the issue out of the treaty. In April 1965, Henry Cabot Lodge, American ambassador to Vietnam, came to Seoul with Lyndon Johnson's personal message to Park asking for Korean combat troops. On May 17, 1965, President Park visited the U.S. at President Lyndon Johnson's invitation. Johnson urged an early conclusion to the talks. When Park met with Secretary Rusk the next day, he raised the issue of Dokdo, a Korean territory to which Japan laid claim, characterizing it as an intractable problem between the two countries. Park made clear to Secretary Rusk Koreans' adamant position on the Dokdo issue, and its negative connection to final ratification of the normalization treaty. Soon after that the agreement between South Korea and the U.S. regarding the dispatch of Korean troops to Vietnam was concluded despite vehement opposition by a large number of Koreans. The Japan-Korea Basic Treaty was signed on June 22, without mentioning Dokdo. Soon five additional agreements covering specific issues followed: fisheries, the status of Koreans residing in Japan, the property claims and economic cooperation, cultural matters, and the mechanism for settlement of disputes. In spite of large anti-treaty demonstrations in Korea, the treaty was ratified in August in Korea, and in December in Japan. Following these two gigantic deals with Japan and the United States, the Park government could pursue its second 5-year economic development plan (1967-1972) with more confidence. The Pohang Steel Company (POSCO), Seoul-Busan Highway, and Soyang River Dam projects were key parts of the plan. In addition to around $8 million worth of grants and cheap loans from Japan, the Koreans squeezed a large amount of cash and aid out of Washington, estimated at $7.5 million per Korean infantry division sent. The operative document was the so-called Brown Memorandum of March 4, 1966, under which about $1 billion in American payments went to Korea in the period 1965-1970. Scholars estimate that this arrangement annually accounted for between 7-8 percent of Korea's GDP in the period 1966-69, and for as much as 19 percent of its total foreign earnings. Soon nearly 50,000 Korean soldiers were fighting in Vietnam, and by the time they withdrew in 1973, as many as 300,000 Koreans had served there. Vietnam became a frontier for Korean enterprise, as many firms, especially construction companies, got contracts to support the American effort. Equally importantly, for the first time, South Korea was regarded by the U.S. as a reliable ally. Meanwhile, South Korea and the U.S. concluded in August 1965 an administrative agreement concerning the status of U.S. troops in Korea (SOFA), thus resolving many thorny problems which had existed since the arrival of American troops in 1945. With the economic boom, Koreans started recovering their much bruised self-confidence. Although normalization with Japan did wonders for the Korean economy and was a breakthrough in South Korea's foreign relations, the settlement had a darker side. Some controversial issues still remain today. It ended the possibility of future claims against Japan, and the Dokdo sovereignty issue resurfaced in the late 90s because it was not completely resolved in 1965. Revelations such as those involving the "comfort women," "atomic bomb victims," and "Sakhalin forced labor" raised the further issues of unresolved claims. The Park government was once accused of having used the $3 million grant from Japan for economic projects instead of compensation to colonial victims. In general, however, a more positive assessment of the settlement has evolved as Koreans have witnessed remarkable economic success. The declassification of all the documents related to the treaty talks in 2005 also strengthened this positive analysis and reinterpretation of the contribution of the treaty to the Miracle on the Han River. * The settlement provided economic funds for the ``Miracle on the Han River'' during 1965-1975. * The biggest breakthrough in foreign relations after 1945, and the beginning of a more proactive, strategic diplomatic opening toward Japan and the U.S.
* ``Dokdo Model'' was a silent, but successful Dokdo policy on Korea's part in 1965. By soliciting U.S. mediation, Korean and Japanese top political leaders succeeded in ``controlling the Dokdo issue'' so that it did not aggravate the Korea-Japan relationship. * Park's adroit use of political timing and bold military decision of 1964-65, when the U.S. desired Korean cooperation in the Vietnam War. It was a good job in working Uncle Sam. * Top leaders' political will and pragmatism in setting the strategic priority straight: Economic development, participation and contribution to world politics, status quo on Korea's effective occupancy on Dokdo.
" First main meeting held after preliminary meeting organized by the Tokyo SCAP headquarters.
" Talks deadlocked when Japan side asked for the return of Japanese properties in Korea.
" The meeting was dominated by confrontation over the issues of claims and fishery agreements. Korean War Armistice Treaty was signed.
" Talks deadlocked after Kubota Kanichiro, chief Japanese delegate, said that Japan's colonial rule was beneficial for Korea.
" Official talks were not held because of disagreements during preliminary meetings over claims and fishery agreements.
" New Korean Chang Myon government attempted to resume talks, and 8 articles of claims were discussed.
" Talks were interrupted by the military coup d'etat on May 16.
" The talks resumed under the Park Chung-hee military government and strong pressure from the U.S.
Nov 12, 1962: The first breakthrough in claims' issue was accomplished in the exchange of a ``Memorandum'' between Kim Jong-pil, the Korean CIA director, and Japanese Foreign Minister Ohira Masayoshi. They reached agreement on the amount of Korean claims compensation: $3 million as grant, $2 million as government loans, and $1 million (later increased to $3 million) in private commercial loans.
" June 3, 1964: Talks temporarily stopped due to violent domestic demonstrations by Korean students; Park recalled Kim Jong-pil.
" February 1965: The two sides signed the Korea-Japan Basic Treaty.
" 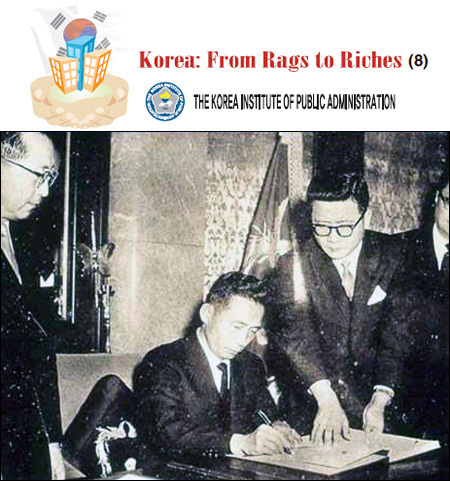 June 22, 1965: Korea-Japan Basic Treaty, claims and other supplementary agreements (fishery, claims issues involving property rights and other legal issues, and the status of Koreans in Japan) signed and officially sealed in Tokyo. Dec. 18, 1965: The treaty became effective through exchange of ratifications. Park Soon-won is teaching modern Korean and East Asian History as an adjunct professor in the History Department, George Mason University, Fairfax, Va.
As an historian specializing in colonial Korea, she has taught modern Korean history and East Asian history courses at Korea and Yonsei Universities, Keio University, and the University of Maryland-College Park, Howard University in Washington, D.C..
She holds a B.A. from Ewha Woman’s University in Seoul, an M.A. in english history from the University of San Francisco, and a Ph.D. in modern Korean history in1985 from Harvard University.